Mummy’s Gold has a excellent reputation thanks to their great promotions and first class customer service. As you might have guessed from it’s Egyptian theme, this casino is Las Vegas inspired and features huge jackpot slots often reaching £2 million! Mummy’s Gold is currently offering an interesting risk free promotion where you are given £500 and 1 hour to win as much as you can. Mummys Gold casino will give you a massive £500 and 1 hour to win as much money as you can. After the hour if you have more then £550 left in your account you can claim any extra as a bonus (provided you have made at least 100 bets). Player will need to deposit £50 before they can claim the winnings. For those who do not win anything with the 1hr promo, Mummy’s Gold also offers a regular welcome bonus. A 100% cash match up to £50. This offer must be claimed within 72 hours of a real account being opened and the bonus must be wagered 40 times before you can cash it out. 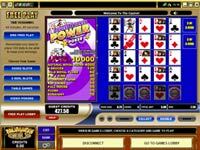 The Microgaming software which runs this casino has an expert feature which will automatically play your games for you. In the case of blackjack it will play according to optimum strategy. The banking system is simple and Mummy’s Gold won’t charge you for withdrawals. If you’re using Debit card, withdrawals can be as fast as the following day. If you need assistance with downloading the software, depositing casino credits, or anything else, you can contact their support team 24/7.